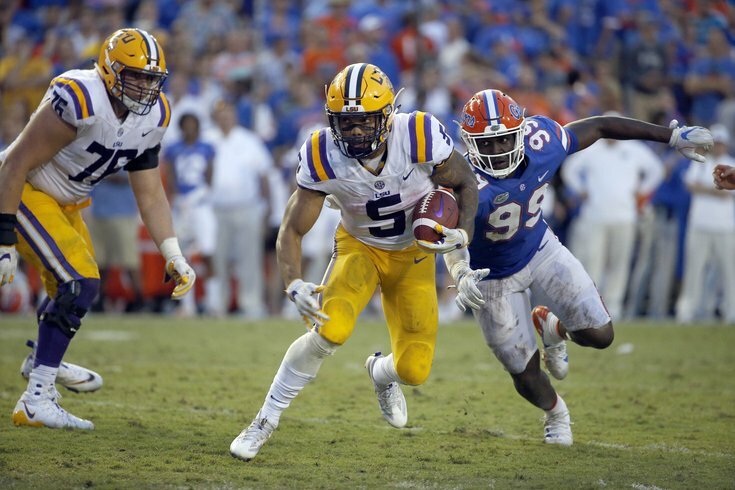 I'm not sure how Derrius Guice could still be on the board at pick No. 32, but if he is, the Eagles should be thrilled. With just two weeks between now and the start of the 2018 NFL Draft, now feels like an appropriate time to put out our fourth Eagles-only mock draft of the offseason. As a reminder, the Eagles only have six draft picks this year, and none in the second or third rounds. Before the start of the 2017 college football season, I thought there was a legitimate debate over whether Saquon Barkley or Derrius Guice was the better player. To be clear, I thought it was Barkley, but not by as wide a gap as others. After a 2017 season in which Guice battled through injuries and saw his yards per carry drop significantly, he was no longer thought of by anyone as being anywhere close to the same category as Barkley. Still, Guice is very gifted, and I think he's going to be a great player in the NFL. With the draft two weeks away, it's crazy to me that many expect Guice to fall anywhere near where the Eagles are picking at 32nd overall. If he's there, I can't see how the Eagles can pass on him. While the Eagles have not yet given up on Donnel Pumphrey or Wendell Smallwood, they also cannot be counted on for any kind of meaningful role until they prove they deserve one. As such, the Eagles are left with just two running backs who are certain to be on the roster in 2018, in Jay Ajayi and Corey Clement. Ajayi is now in the final year of his deal in 2018, and the Eagles have openly acknowledged his knee issues. Will the Eagles let him walk in free agency next offseason? It's very possible he won't be on the team in 2019. That leaves Clement as the only sure-fire long-term back on the roster, and so, the Eagles would be wise to draft one now who can be a long-term answer at the position, while also potentially becoming an immediate contributor. It doesn't take long for running backs to make significant contributions in their rookie seasons. In fact, in each of the last two seasons, a pair of rookies (Kareem Hunt in 2017, Ezekiel Elliott in 2016) led the league in rushing yards. With a team like the Eagles who are trying to repeat as Super Bowl Champions, Guice would give them a potential impact player from Day 1. He's also only 20 years old, and could be a high impact, low cost player for at least five years. During the pre-draft process, the Eagles have brought in a number of defensive back prospects who can potentially play in the slot. One who has not yet visited the Eagles (or at least it hasn't been reported that he has) is M.J. Stewart of UNC. At the NFL level, I believe Stewart will be best utilized as a safety and slot corner. Schwartz loves his safeties to have cornerback in their backgrounds. The Eagles are thin on safety depth, and I believe that Stewart could be a good third safety, with the potential to contribute early in his career in the slot. This is a very unsexy pick, as Smythe's college production wasn't exactly all that impressive. By comparison, over the last two seasons, South Dakota State TE Dallas Goedert had 164 catches for 2404 yards and 18 TDs. BUT... Smythe is very good blocker, and could seamlessly fill the role vacated by Brent Celek. Here's a cut-up of Smythe against LSU last season. There are a couple receptions thrown in (he can catch, despite the numbers above), but focus on his blocking. After losing Celek and Trey Burton, the Eagles were clearly going to be in the market for a tight end. First, they signed Richard Rodgers to a veteran minimum deal in free agency. I believe that he'll fill the back pass-catching role, while the Eagles will look to add a mid-round tight end with good blocking ability in the draft, and Smythe would be a good fit. At the 2018 NFL Combine, Noteboom ran a 4.96 40 (94th percentile among OTs since 1999) and a 4.44 shuttle (96th percentile). As such, he possesses athletic traits that will appeal to Doug Pederson and Co. The downside is that Noteboom is thought to be deficient, technique-wise, and could take some time to develop into a player worth seeing the field in the NFL. For the Eagles' purposes, that's fine, as they already have impressive depth at OT, but could benefit by continuing to fill the offensive tackle pipeline in anticipation of the eventual retirement of Jason Peters. The Eagles don't have many team needs, so they don't have to worry about their later-round draft picks providing any sort of immediate contributions. At DT, they have Haloti Ngata on a one-year contract, and Bennett (who kicks inside on obvious passing downs) essentially on a string of one-year team options, so DT depth is a potential need in 2019 and beyond. The Eagles need a returner, and Henderson was one of the best in the country for Pittsburgh during his career, as he had seven returns for scores (4 KR, 3 PR). Offensively, Henderson is little more than a gadget player. As you can see in the above highlight reel, Pitt loved using him on jet sweeps. In the first half of the 2016 season, Doug Pederson seemed intrigued by Josh Huff's ability as a ball carrier, as he tried to find creative-yet-simple ways to get the ball in his hands. He could potentially do the same with Henderson. Still, Henderson has a long way to go before he'd ever be used as a traditional receiver (even in the slot), and may never be anything more than a returner / gadget guy, which is why he could be available this late in the draft.